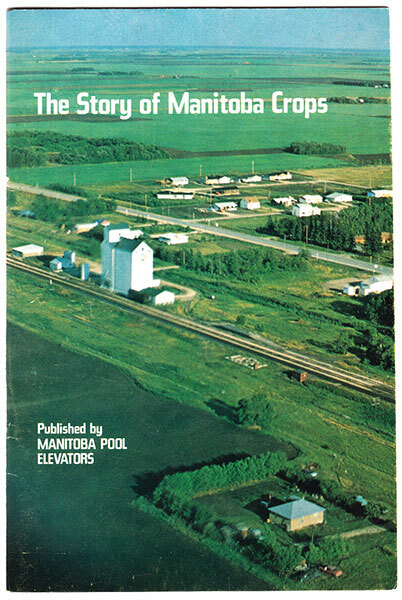 Manitoba Pool Elevators came to life in 1925 as a creation of the Manitoba Wheat Pool, the latter founded in 1924 to ensure the co-operative marketing of wheat by Manitoba farmers. The Pool went bankrupt in the early 1930s, but Pool Elevators survived and prospered over time, extending its reach into every corner of rural life. In 1975, the Pool, in association with Brandon University, laid the foundation for the S. J. McKee Archives with the donation of $25,000 and the first instalment of its archival papers. More followed, and after the transformation in 1998 of the Pool into Agricore Co-operative, Ltd., then in 2002, into Agricore United and finally, in 2007, into Viterra Inc., the Pool’s complete archive arrived at Brandon University. It comprised over 100 metres of textual records and thousands of images—an extraordinary archive essential to any account of Manitoba’s development in the 20th century. The leaders of this formidable grass-roots movement— local chapters covered rural Manitoba—were committed to the idea that the progress of the co-operative idea required an informed membership. So, the Pool published newspapers (The Scoop Shovel and The Manitoba Cooperator), created a travelling library, offered lectures and informed commentary through radio broadcasts, and distributed circulars on the operation of elevators, the grain trade and rural life. The Pool also collected and published pamphlets for circulation to its members on topics of importance to agrarians and their families. The collection includes hundreds of pamphlets published between 1888 and 1992 with a complicated provenance. There are pamphlets published by the World Students’ Christian Federation, the Christian Social Union (Oxford Branch), Britain’s Cooperative Union, the Western Producer, Roblin’s Women’s Institute, the Alberta Wheat Pool, the American Farm Economic Union, the Co-operative Union of Canada, the National Farm Forum, the Winnipeg Grain exchange, the United Co-operatives of Ontario, the Co-operative Union of Manitoba, St. Francis Xavier University (Extension Department), and of course Manitoba Pool Elevators. Subject matter is equally diverse: the social significance of the co-operative movement, poverty in Canada, western community life, rural women, rural health (more on this later), freight rates, co-operation (theory and practice), the Winnipeg Grain exchange, George Jacob Holyoake, farmers and the state, education for action, Christian Socialism, and mass meetings in Saskatoon featuring Aaron Shapiro. This panorama of subject matter illuminates the influences that shaped the co-operative movement in western Canada and the pre-occupations of the Pool. Why are these publications—research libraries refer to them as fugitive print ephemera—worthy of attention by posterity? Assuming their modern form in the 18th century, pamphlets allowed controversialists to enter the public sphere to engage controversy. (Edmund Burke made public his reflections on the French Revolution through a pamphlet.) Written to convey and to argue a point of view in the past, now they constitute a residuum of unique historical data. The presence of pamphlet collections in research libraries such as the Tamiment Library at New York University, the London School of Economics, and the Fisher Rare Books Library at the University of Toronto, are a testament to the importance placed on pamphlets as primary sources for historical research, as authentic sources of raw historical data. Usually less than 49 pages in length, unbound, and printed on cheap, lightweight paper, pamphlets were printed cheaply and distributed rapidly to address a current concern or controversy. Such timeliness makes it unlikely that pamphlets will be republished except as the focus of digital projects. The history of the prairie co-operative movement is presented in pamphlet-length instalments. The struggle of grain growers to free themselves from the grasp of the Winnipeg Grain Exchange; the concerns of Canadian producers with worldwide wheat production, wheat prices, and wheat surpluses/deficits; and the fight to forestall the dissolution of Crow’s Nest Pass Agreement (i.e., “the Crow Rate”) are a few of the themes evident in the Pool Pamphlet Collection. Mundane matters are also addressed. There are pamphlets dealing with operating a pool elevator, training young people to be farmers and running a ladies’ study group about the co-operative movement. The eloquent public addresses by pool leaders including Aaron Shapiro and Alexander James McPhail appear here in pamphlet form, as do the persuasive writings of J. T. Hull and Ralph S. Staples. 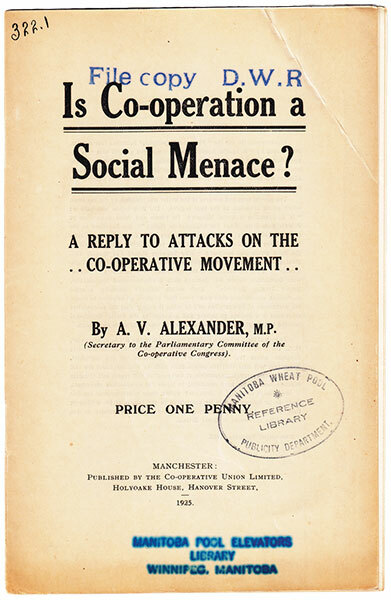 Pamphlets from meetings and inaugural addresses of the Co-operative Congress in Great Britain, from the Christian Social Union in England, from the Antigonish Movement in Nova Scotia (some written by Moses Coady), and of speeches made in the United States about the Canadian co-operative movement and Canadian grain production, offer a broader picture of the worldwide co-operative movement. Oftentimes, a pamphlet would be followed by rebuttal pamphlets and counter-rebuttal pamphlets. For example, three pamphlets illustrate the tension between the Winnipeg Grain Exchange and the wheat pool movement. On 22 October 1930, Sydney S. Gampbell gave a lecture at the City of London College in England. This anti-pool lecture was subsequently published by the Grain Trade News (an organ of the Winnipeg Grain Exchange) as “Canada and her wheat pool.” In January 1931, the Saskatchewan Co-operative Wheat Producers published its rebuttal to Gampbell, “A reply to ‘Canada and her wheat pool’” and in February 1931, the Alberta Wheat Pool published its rebuttal to Gampbell, “A defence of Canada’s wheat pool: a reply to Gampbell.” They are all here to read and ponder. Of course, prairie farmers and their families were concerned with more than just the production of wheat. Several pamphlets address the issues of health and the rural populace, proper nutrition for children, building rural medical facilities, mortality rates of rural vs. urban populace, and infant/maternal health. A chart on infant mortality between 1911 and 1940 in a 1945 pamphlet promoting rural health care is especially poignant, as is the statement in a 1946 pamphlet: “In Canada, as a whole, during the Second World War, infant losses, including stillborn and deaths under one year of age, are reported by the Federal Department of Health as approximately 130,000 compared to Canadian war dead of approximately 41,000.” A simple pamphlet, a call for help, is a disclosure to the 21st century researcher of the reality of life on the Prairies and of the reasons for the strength of the movement for free universal medical care advocated by the Pool. These pamphlets are available physically at the S. J. McKee Archives at Brandon University. They are fully described and available through the university’s library catalogue under the series entry, Manitoba Pool Elevators Pamphlet Collection. The Archives hopes to reproduce these pamphlets digitally, making the digital copies accessible via a hyperlink through both the S. J. McKee Archives website and through the bibliographic record on the library catalogue, as are the documents in the Robert Dudley Howland Fabian Society Collection. The British influence on Canadian cooperators was formative. 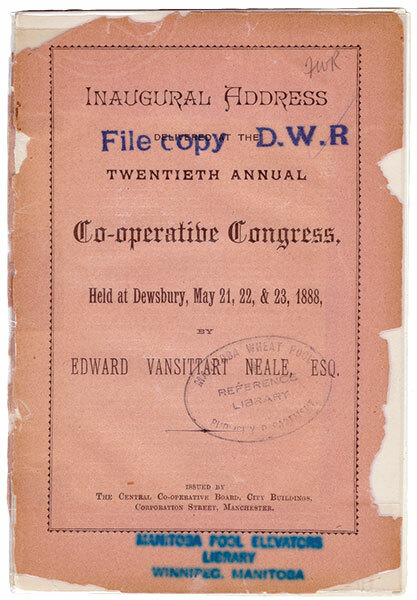 Among the pamphlets are ones on British meetings such as this 1888 example from Dewsbury. Pamphlets were often about controversy—about general principles or practical actions, such as this 1925 British example. 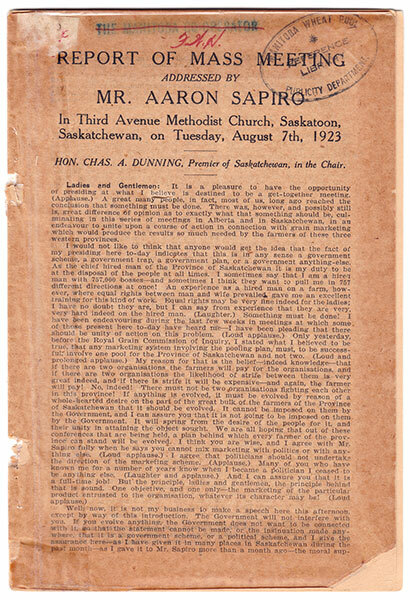 American cooperative activist and lawyer Aaron L. Sapiro (1884–1959) toured Canada in the 1920s. Pamphlets such as this 1923 example from Saskatoon helped to launch the “pool” movement in Western Canada after the Great War. The Pool fought to reduce child mortality in rural Manitoba and improve access to health services, and issued pamphlets to encourage adoption of good health practices. The Pool had utopian tendencies—its story was about progress, progress, progress. 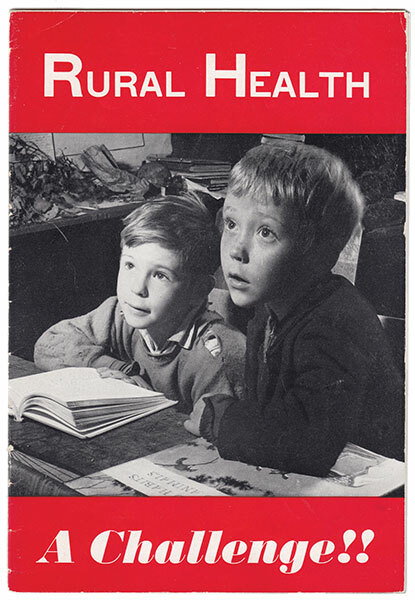 The cover of this pamphlet from the 1960s featured a view of agrarian life in Manitoba. I would like to acknowledge Tom Mitchell for his useful suggestions for revisions to the original draft.